The Runner | Federation Of Post Secondary Educators Campaigns For "Precarious Profs"
For thousands of college and university instructors across the province, job security is far from guaranteed. In B.C., around 30 per cent of post-secondary faculty and staff are employed on a part-time or temporary basis. 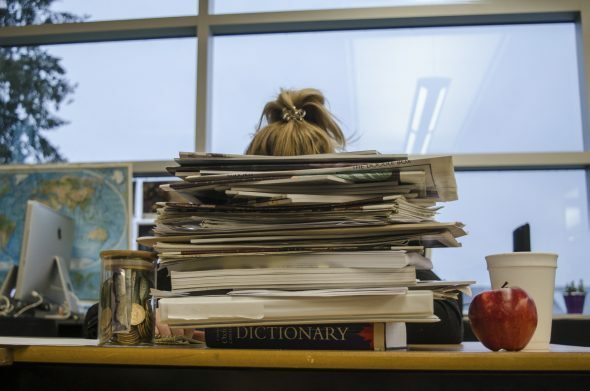 According to the Federation of Post-Secondary Educators of British Columbia, the working conditions for these educators are not equal to those of their full-time and permanent counterparts. As part of the FPSE’s advocacy, the organization has launched a campaign named Precarious Profs to address what it considers to be unfair practices by post-secondary institutions towards non-regular faculty. “The Precarious Profs campaign is meant to highlight the plight of sessional and part-time contract workers and make our case to regular faculty, to students, to the public that equal work deserves equal pay,” explains FPSE President George Davison. The Federation of Post-Secondary Educators of B.C. represents about 10,000 faculty and staff at teaching universities, colleges, and private sector institutions across the province. The organisation provides lobbying, grievance support, bargaining support, and more for the employees it represents. According to Davison, British Columbia currently has a lower ratio of non-regular professors to regular professors than in the United States and some other parts of Canada, such as Ontario. However, the FPSE is concerned that the number of non-regular professors in the province is steadily rising. In its current form, Precarious Profs is mainly an internal campaign. The FPSE’s non-regular faculty committee has been busy gathering the stories of its members who work on a sessional or part-time basis to present how these practices affect post-secondary educators. Davison says that the goal of the campaign is to create awareness and solve these issues through collective bargaining with institutions rather than through legislation. “We’re telling the stories of individuals who have the same qualifications as a full-time regular person, who teach the same classes that the regular professors teach, but get paid a fraction of what the regular professors do,” says Davison. Each institution’s relevant policies and practices are different, but it is the stance of the FPSE that non-regular employees are commonly treated unfairly in a variety of ways by B.C.’s colleges and universities. In addition to being paid less often for teaching the same courses as full-time professors, non-regular professors also miss out on receiving the same benefit packages as full-time instructors. At some institutions, regular professors receive allowances for professional development, while non-regulars do not. For professors working on a contract basis, finding their next job is a constant concern. Teressa Fedorak has been working as a non-regular professor at Thompson Rivers University for about 15 years. Before being hired as a continuing sessional she had to interview each year for her next contract. She says that this arrangement can cause mental stress and difficulty with making long-term personal plans. It’s easy to see the allure of hiring non-regular faculty to institutions in B.C. Davison explains that, along with it being more cost effective, the contract arrangement provides more flexibility when hiring; institutions are able to sign someone to teach a course at the very last minute. In Vancouver, which is home to a large pool of educators looking for work, it’s very easy to find professors to fill these contract positions, he says. Davison compares this practice to fast-food chains using temporary foreign workers to decrease the cost of doing business. He estimates that the number of non-regular educators in B.C. and elsewhere began to gradually rise in the mid-80s as a result of universities looking to cut operating expenses amidst a recession. The FPSE has been lobbying for more full-time positions and fewer non-regulars since this trend began. In 1998, and as a compromise between institutions and advocacy groups like the FPSE, negotiations to eliminate secondary scales and contract work resulted in a provincial agreement on “regularization procedures.” These procedures mandated that non-regular faculty members who have worked half-time over two years and reasonably expect to continue doing so during their third year would be regularized, thus receiving the same benefits and pay scale as full-time faculty members. Davison says that since 2000, when the provincial government under the B.C. Liberals cut back on operating funds, institutions have found ways around regularization. A common way to do this has been to give non-regular faculty slightly less than half-time work in the first two or three years of employment. Despite the challenges this poses for some instructors, not all non-regular faculty see their employment situation as an issue. Cam Tucker, a non-regular journalism professor at KPU, says that his part-time status has allowed him to ease into his role as a relatively new educator. “My status [as a sessional instructor] allows me to work as a journalist, both for a local daily newspaper and a national television network in the U.S. … in addition to teaching a course on sports journalism,” he says. Tucker’s situation is not unique, particularly at a polytechnic institution like KPU where many professors are actively engaged in their fields. Still, Fedorak argues that there are other concerns that should be shared by all contract professors. One of those, which affects both regular and non-regular faculty but has a unique impact on sessional professors, is the threat against academic freedom and freedom of speech. Sessional professors in particular may avoid speaking out for fear of not having their contracts renewed. While institutions are prohibited from firing a faculty member for criticizing their institution or expressing a controversial viewpoint—as long as that viewpoint does not constitute hate speech—they can in some cases manipulate the language of a collective agreement in order to hire someone else for the next contract. “Non-regular faculty do not have the ability to truly speak their mind or share their true thoughts,” says Fedorak. It’s for this reason, she says, that few non-regular professors are willing to risk their careers by openly criticizing the working conditions caused by their non-regular status. At the time of writing, the Precarious Profs campaign has received 206 signatures of support. The FPSE will be moving onto the next phases of the campaign in the coming months.